KIEV, Ukraine - They are the scenes you rarely see splashed across the newspaper’s front page: a soldier lazily stretches in the shade beside an artillery tank; servicemen in T-shirts gamble for cigarettes; a man reads a book while guarding artillery poised to blast at the onset of a trigger. 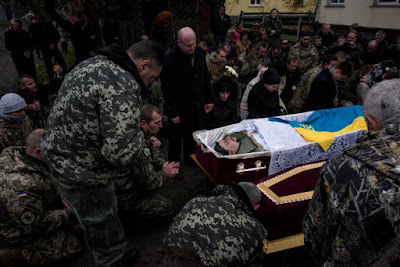 Relatives and comrades say their last goodbye to Ukrainian serviceman Vitaliy Kravchenko, whose body is in the coffin. He was killed by a mine explosion near Avdiivka, during a commemoration ceremony in Rava-Russkya, western Ukraine. For photojournalist Evheniy Maloletka, the fallout of the Ukrainian revolution hits close to home — Berdyansk city in southeast Ukraine, to be exact. As the war zone expands, inching closer to his hometown, he documenting not only the historical changes as they unfold — massive riot attacks and anti-government protests that have left disheveled city centers and countless deaths — but also the quiet moments of men who volunteered to be involved in the conflict. “With every passing month, the war in the east has cast our country backward, brought sorrow to the families of dead soldiers and civilians, destroyed the economy and created conditions of social injustice,” Maloletka tells TIME. Maloletka has been covering the Ukrainian revolution since its beginnings in November 2013. After graduating from the Kiev Polytechnic Institute in 2010 with an electronics degree, he started his career as a staff photographer for the local news agencies UNIAN and PHL. He was drawn to big news events, from the presidential elections in Belarus in 2010 to the Max Air Show in Moscow. He covered the KaZantip electronic music festival in Crimea and Georgia, the 2012 European Football Championship, in between trips to India, Liberia, Ivory Coast and Kenya. But he kept coming back to the situation in his own country. His EuroMaidan series captured images of massive anti-government protests, student rallies and riots in the so-called Euromaidan Revolution, and violence in Kiev’s Independence Square. While he also covered the conflict in Crimea, he’s spent most of his time in eastern Ukraine working on small photography pieces and long-term documentary projects for the Associated Press, among other outlets. As for his photographic style, Maloletka says he’s always experimenting. “I’m trying to shoot every new story with a different style,” he says.